Modifies character scripts to stop the endless repeating dialogs and to enhance NPC behaviour. You just wanted to take a walk to the market, buying some cheese, but you can't enjoy from all the voices maltreating your ears? There is a heavy issue with endlessly repeating dialogs in Divinity Original Sin which hasn't changed with Enhanced Edition. Always hearing the same automated dialogs and the same shouting voices again and again is an atmospheric killer and leads to staying away from these areas, or even the game! This mod produces relief. From now on NPCs keep silent for a good while, so you can do your business without any annoyances. But the approach is not just to let NPCs do nothing during the time they keep quiet, but to conserve or even improve immersion by scripting new animations and actions. So, there are new things to discover and good reasons to come back to some places! This is work in progress: I will add more modified character scripts to achieve a better balance between sound and silence and to give NPCs more complex behaviour. Take a look at the Cysealean Drill Sergeant and his recruits; they give an idea of where I want to get with my mod. I don't have much time at the moment, so this will grow slowly. But don't hesitate to come back to my site and look for new updates, and to make suggestions on what you would like to see next! For installation and mod compatibility see below. Please endorse if you like my mod! It can hardly be found without your visible appreciation! This Mod is content complete now! Maybe there will be a few additions and adjustments but all in all it's finished! Thank you very much for your interest and your endorsements! If there are any NPCs that I didn't regard or voicelines that still repeat too often, please report in the comment section. If you don't like some of the changes or anything is not as expected, tell me! One last thing: Some characters already have notably more animations and/or reactions (e. g. Moira, Murphy, DrillSergeant and Recruits, GuardBowTraining, GuardBarracksCook). I think it's a good idea to focus on frequency of automated dialogs and (voiced) text display with this mod and continue enhancing NPC behaviour in another project, so you can choose. The new project will start in a couple of weeks and contain all changes made with this mod, and much more. Would be happy to see you again! SpeechlessNick: reduces chance of incombat comments for HeadlessNick to 15% per turn (orig. 100%). Alternative version: reduces chance of incombat comments for Headless Nick to 10% per turn and 15% at summon (orig. 100%). SkillUse ; Miss ; Junk ; StatusEffects ; LowHealth ; Kill ; Block ; CriticalHit. Extract the ZIP-Folder to the main directory of D:OS Enhanced Edition. The files will be integrated into Data/Public/Main/Scripts. To uninstall just remove the files from the 'Scripts' folder. You can decide individually what scripts and changes you want in game. Please note: Some of the scripts are corresponding. Deleting single scripts can lead to unexpected NPC behaviour. Contact me if you need help. This mod is made for D:OS Enhanced Edition. I haven't checked if NPC behaviour has been changed from Classic Version, yet. But in most cases it should be possible to use my character scripts for Classic Version as well! Tell me if you would like to do that! Compatible with all saves! You can add and remove my character scripts whenever you want. There are no changes on story, so it's not expected to break your save or your game. Compatible with all mods that don't make changes on character scripts used in my mod (so: compatible with Baardvark's Mod Scales, Frau Blake's XC_Bags, Ameranth's Epic Encounters and most other mods). If you use my 'StandStillWhenIAttack'-Mod don't forget to install the QuietDay-Patch (available on 'StandStillWhenIAttack'-site). Not compatible with all mods that make changes on character scripts used in my mod. If there are effects on NPC behaviour that don't seem as expected, please tell me! I don't change KI in combat. Watch out Baardvaarks Mod Scales to get combat-related improvements on KI and much more (see Recommended Mods below). 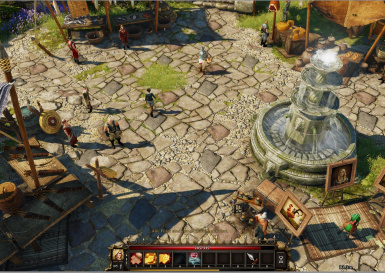 It might be a good addition for getting a better experience of Divinity Original Sin EE. Potentially, there have to be some adjustments to NPC behaviour (chance and time to execute an action or animation, to start automated dialogs or to display and speak some text). Many things I made random to occur within a certain space of time, but sometimes it could be too long or too short. At a certain point it depends on personal preferences.